1.1 Please provide the right information for your invoice/shipping details. 1.2 You are solely responsible for your invoice information while purchasing. 1.3 You will have to pay prepayment as 50% of the voucher if you wish to get a customize service. 1.4 Customized Lead Time 14 Days, after confirming order. Additional 3-5 day may required for fittings & bespoke services. 1.5 Outside of Dhaka city full prepayment is required before taking delivery from Currier Service. Conditional, which is called VD(Value Declared Service) in local Currier. 1.6 If any product needs to be return for alter/refitting , it must be done within 90 days of delivery. Otherwise additional service charge may required for processing the alter/fitting/shining etc. 1.7 Used and damaged products cannot be returned. 2.1 10 Years Double Refund Policy. if you could prove that our JACKET isn’t Genuine Leather after all these years, we will give you Double Refund. 2.2 30 days Full Refund Policy. Full payment will be refunded if RAVEN would unable to provide the product within 30 days. 2.3 1 Year Free Replacement Warranty. 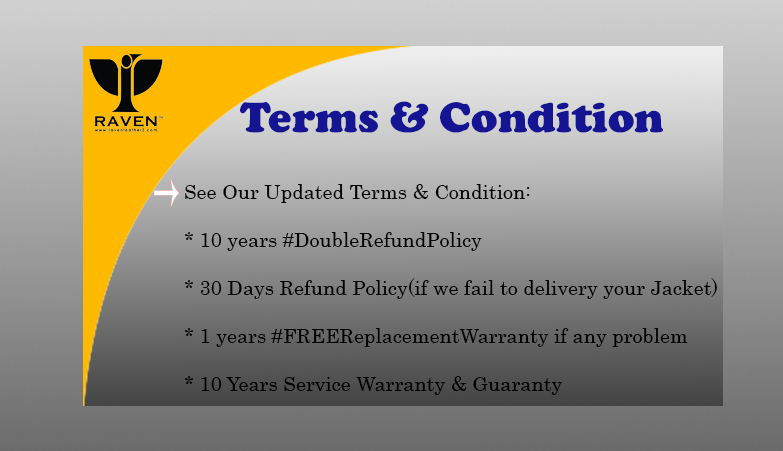 If you found any trouble in our Jackets(Leather Mostly), we will give you 1 year warranty free of cost. 2.4 Refund time 2 weeks after order cancellation/confirmation. 3.1 All our leather jackets come with a 10 years Warranty & Guarantee . Except for accidental burn, puncture, hard scratch, cut, fungal attack due to poor maintenance. 3.2 1 Year Free Replacement Warranty. If you found any trouble in our Jackets(Leather Mostly), we will give you 1year warranty free of cost. 3.1 General customization charge within RAVEN’s design 500/- BDT. 3.2 Customer provided design customization charge 1,000/- BDT. 3.3 Measurement taking charge from customer place 200/- BDT. 4.1 Inside Dhaka city local delivery charge 150/- BDT. Time: 24-48 hours after confirmation.